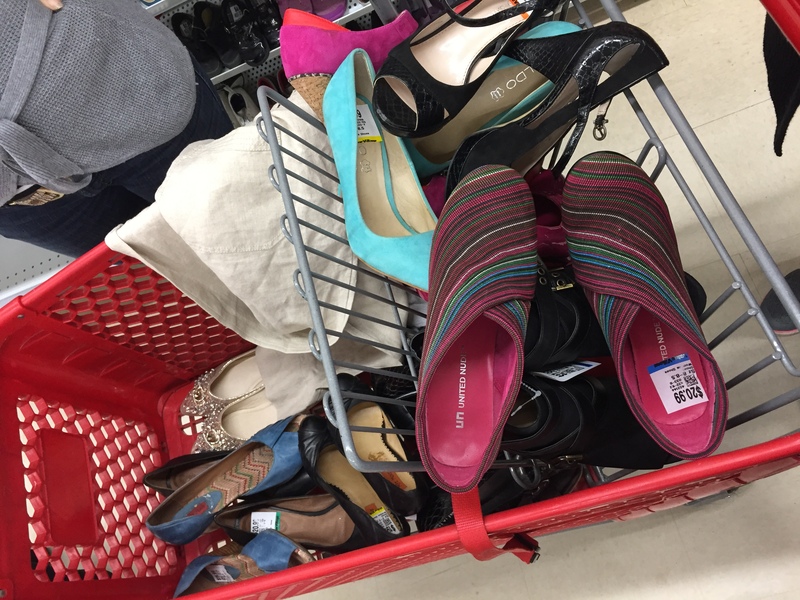 I had an amazing opportunity last week to get a behind-the-scenes look at Value Village while helping three local store managers find outfits for an upcoming international Value Village conference in Orlando. 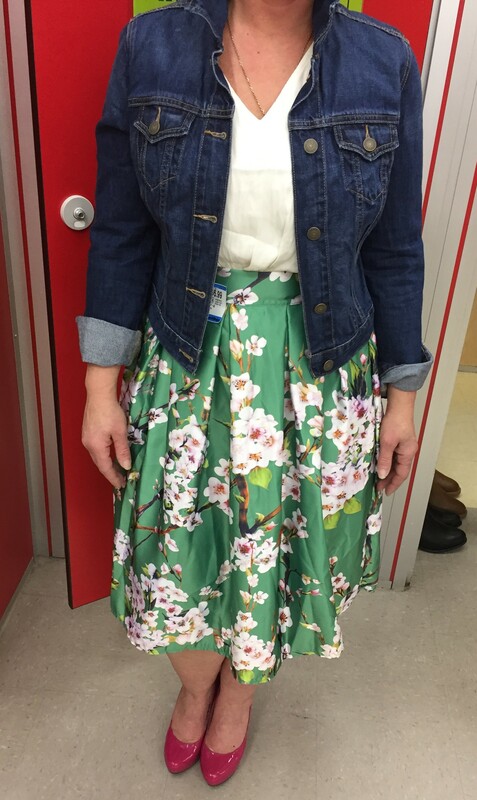 The conference includes a fashion show where store managers from around the globe will be walking the runway in thrifted fashion which is AWESOME on so many levels! I LOVE that real men and women will be modeling real secondhand clothing and showing that sustainable, ethical fashion is a viable choice for pretty much everyone. 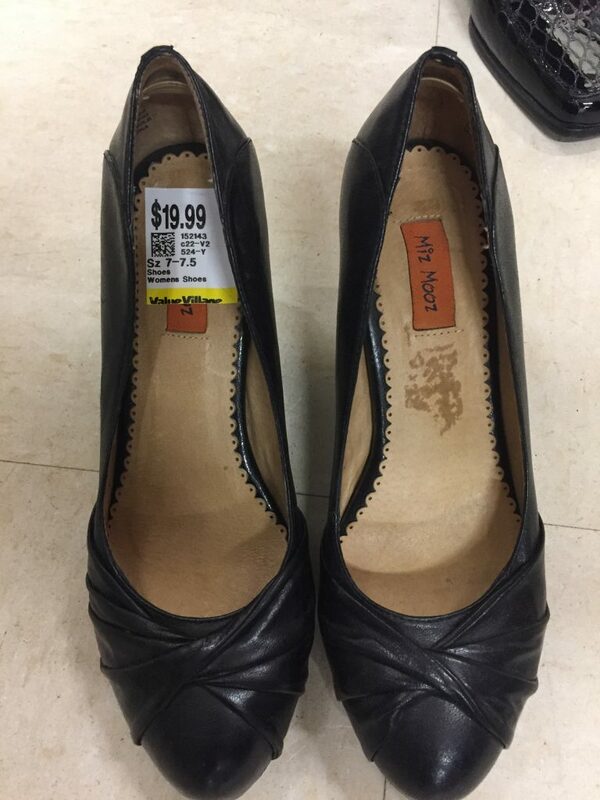 Way to go, Value Village! 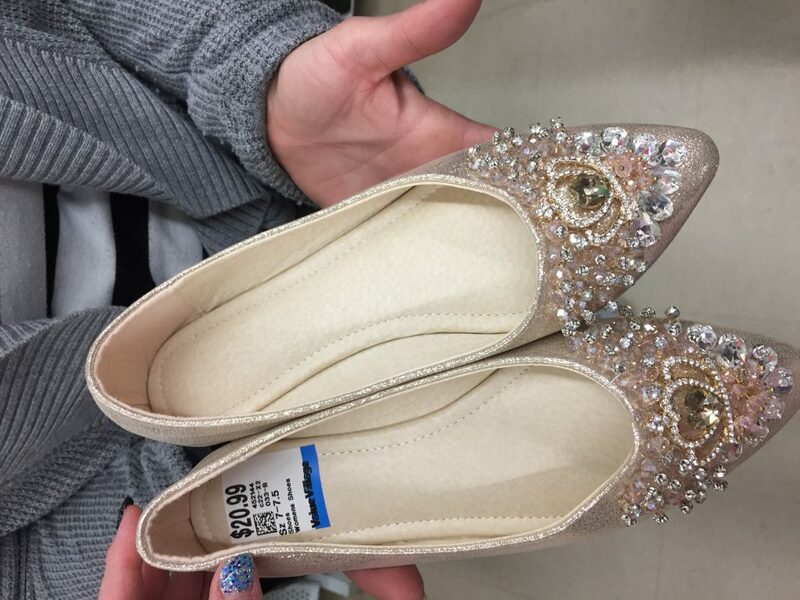 Princess shoes in Corinne’s size!!! In perfect condition! They didn’t work with the outfit she had in mind but I advised to BUY THEM ANYWAY because they’re so pretty! I envision them with a pair of skinny jeans and a plain white tee! 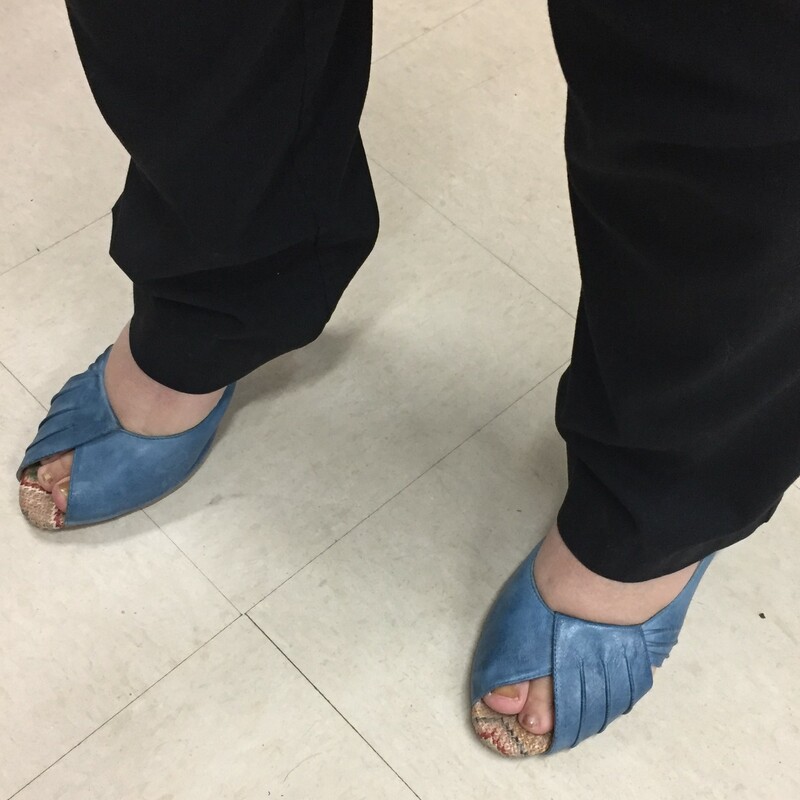 Tiffany found these Miz Mooz wedges in such a gorgeous colour! I might have had a little thrift envy!! 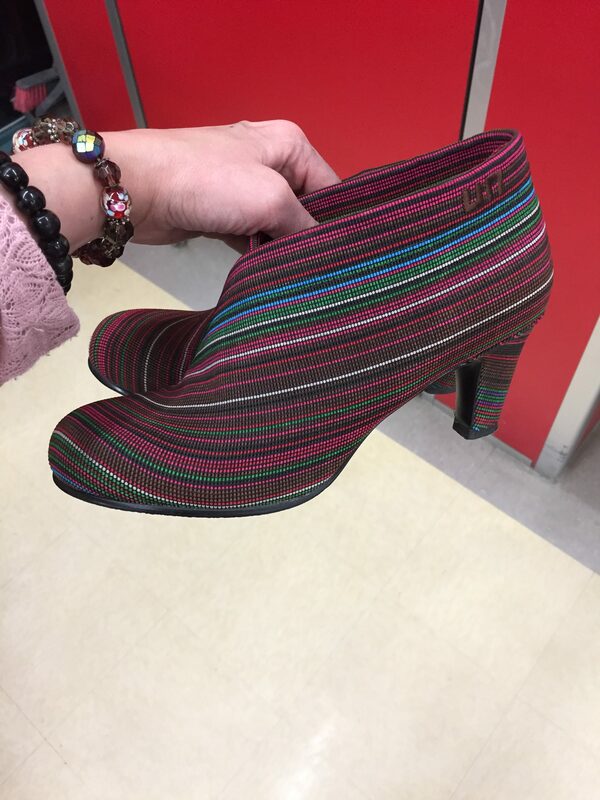 And THEN Bernadette found new-with-tags Fly London ankle boots. 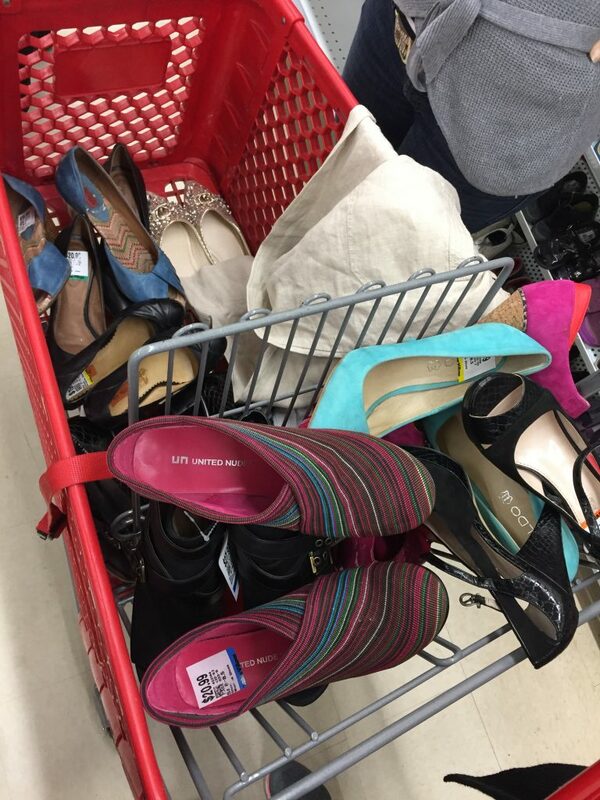 #fullonthriftenvy These ladies definitely have the thrifting mojo! 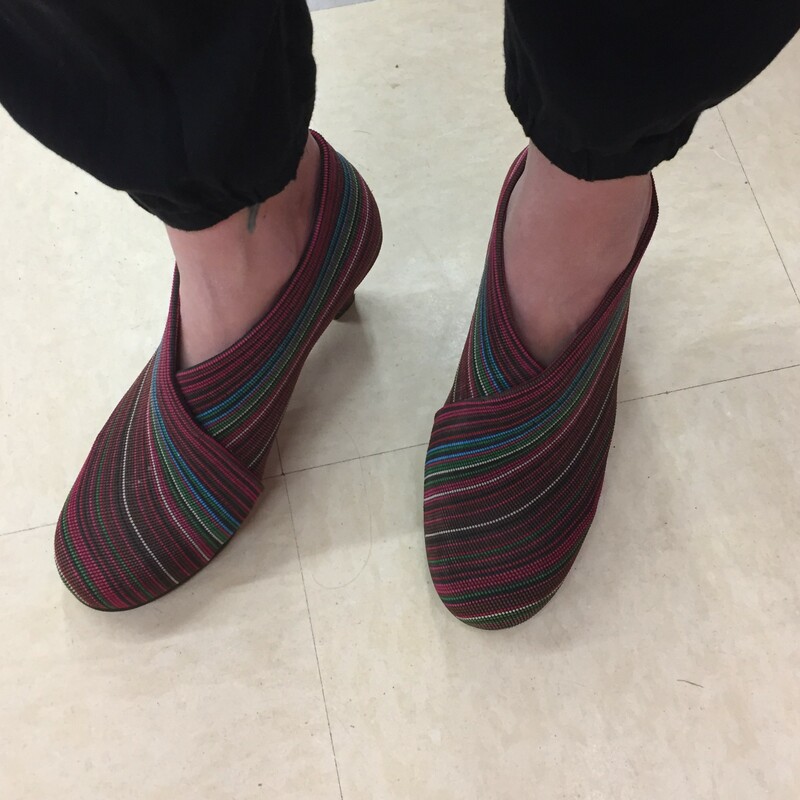 After an ugly-stepsister moment, I managed to wear them long enough for a photo! Too small, too bad!!! Corrine was drawn to the green-print midi skirt and built her outfit around it using the styling trick of mixing “fancy and casual“ – opposites attract! 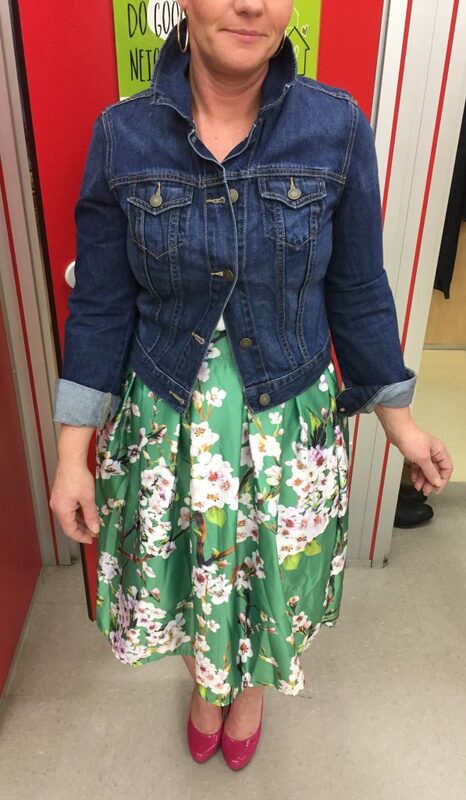 The pretty party floral is the perfect contrast with a denim jacket or chambray shirt. YOU’RE WELCOME for not nabbing this outfit for myself!! XOXOXOXO We did discuss the importance of tucking the top in more than what you might initially do – otherwise your waist disappears! 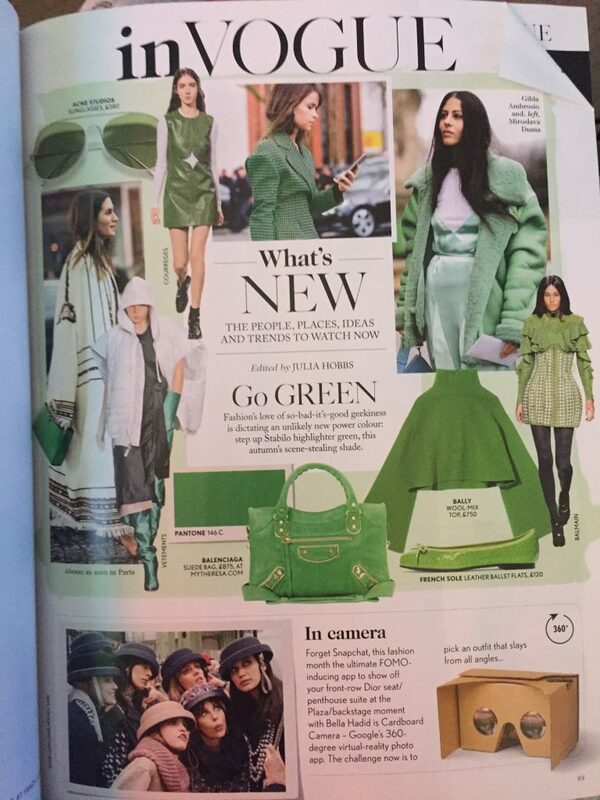 Corinne is right on trend as the December issue of Vogue included a “go green” feature! Patent pink pumps and a green leather belt put the final finishing touches on the ensemble. 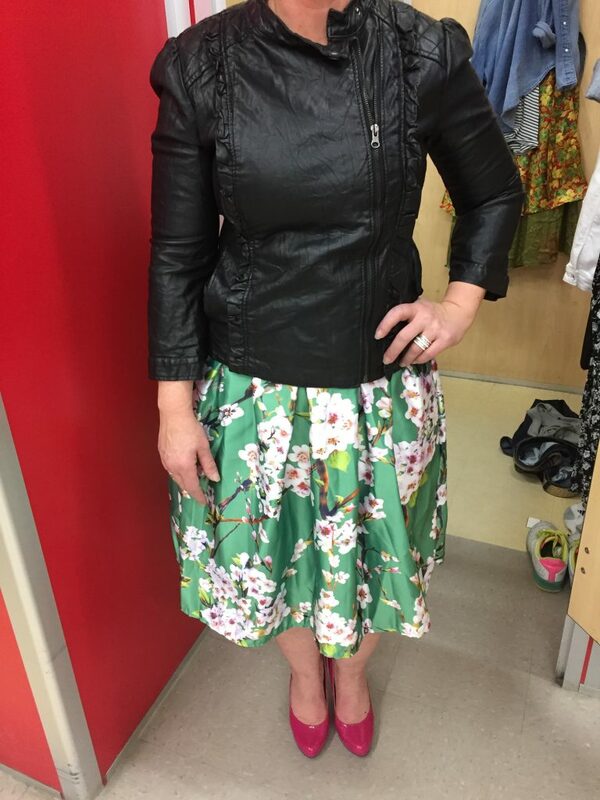 Corinne found several other pieces that looked great with the skirt! 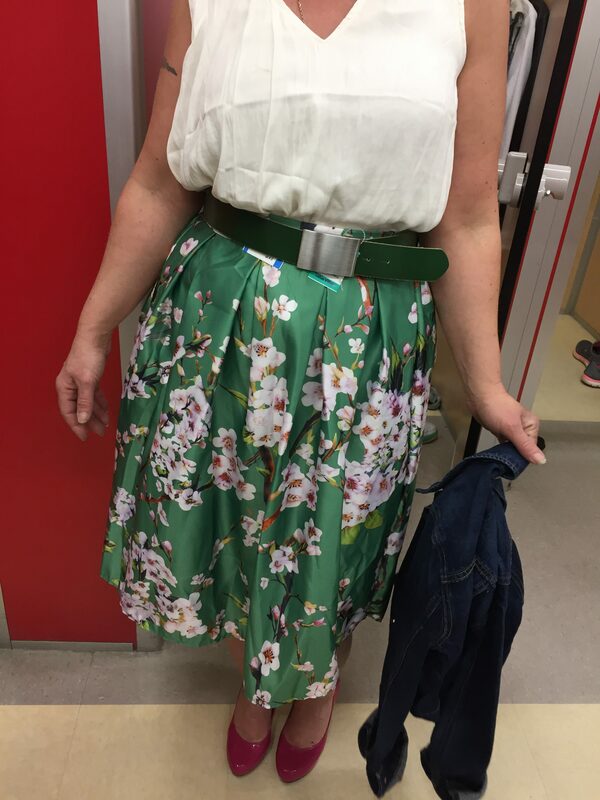 The lesson: immediately go and thrift a floral midi skirt, preferably in green. 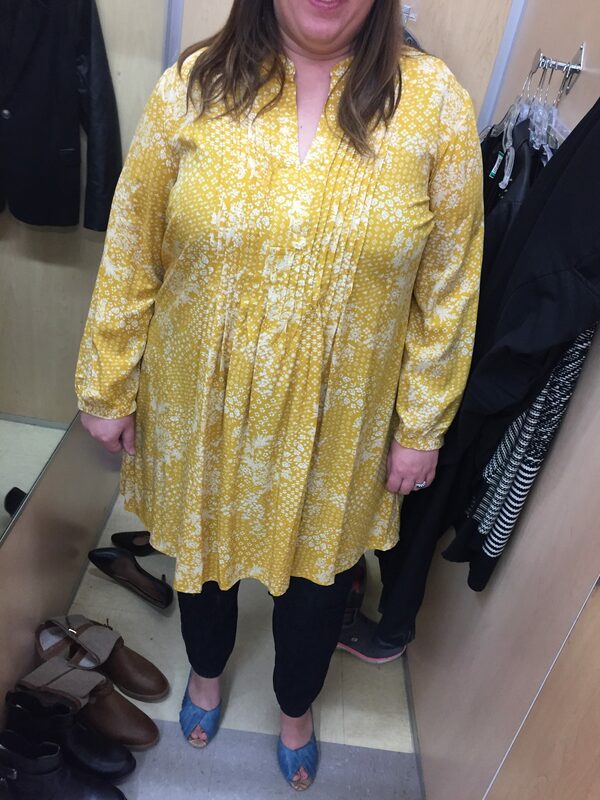 I was so hopeful for this mustard-print tunic but alas it was too big and not quite Tiffany’s vibe. Tiffany is a hard-working busy mother to a busy 5-year-old. 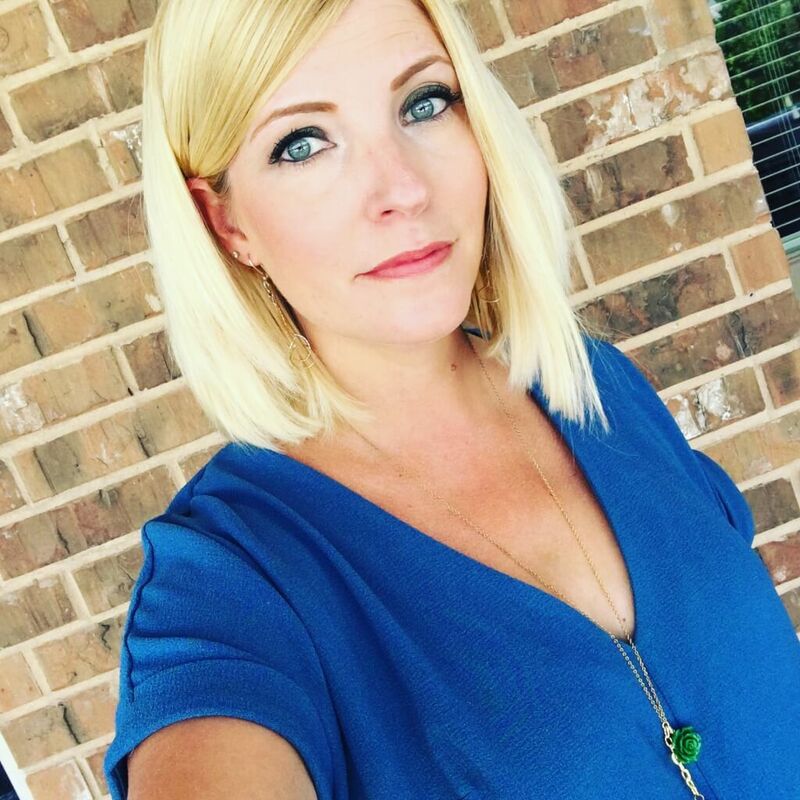 Like all moms, she wanted to avoid the “frumpy mommy” look and did just that with this ELEVATED “mom uniform”!! 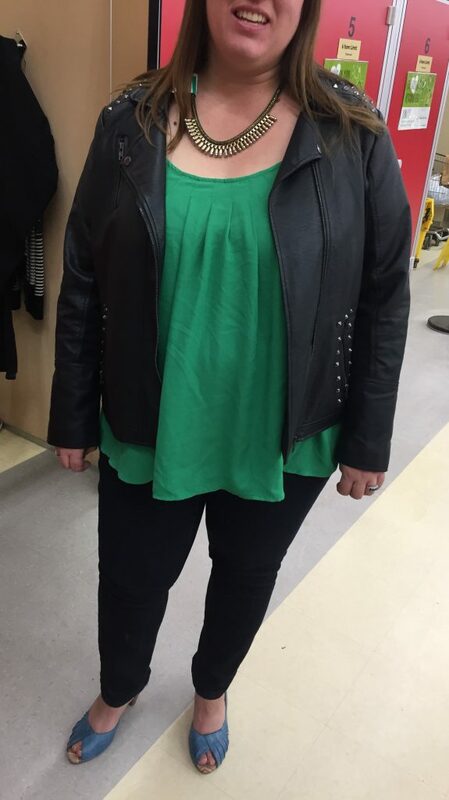 Swap out tired mom jeans for dark wash skinny denim, dingy t-shirt for a pretty jewel-toned shell, sad hoodie for a studded vegan-leather moto jacket, and running shoes for colourful and comfortable Miz Mooz peep toe pumps! 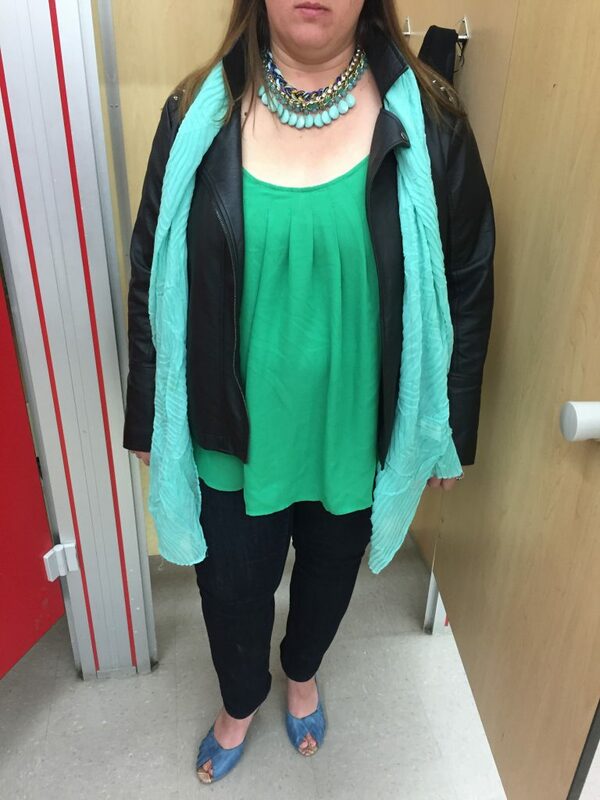 Tiffany finished her look with a light aqua scarf and statement necklace that tie her look together from head-to-toe! 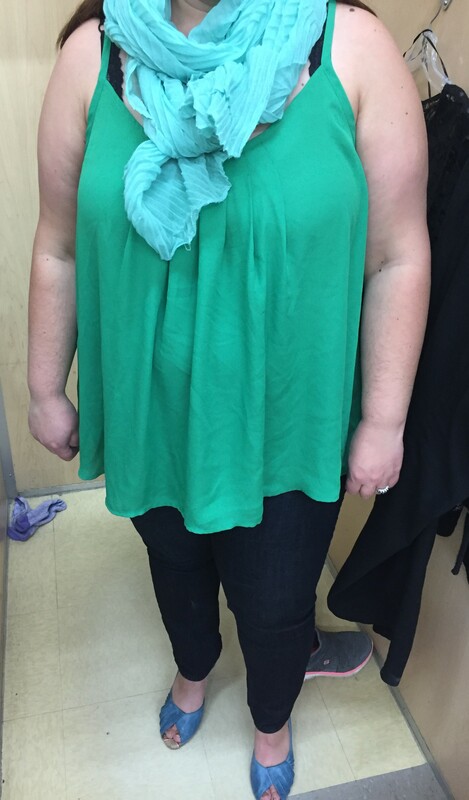 Thrift stores are a great place to look for on-trend items (e.g., the statement necklace!!!) that no one else will have! Somehow or other, I neglected to get photos of Bernadette throughout her shopping experience! However, I will share that Bernadette was on a mission to find an outfit outside her comfort zone! She doesn’t normally wear jeans (WHAT!) and initially reached for the typical boot-cut until she stumbled upon a pair of new-with-tags Kenneth Cole distressed skinny jeans! 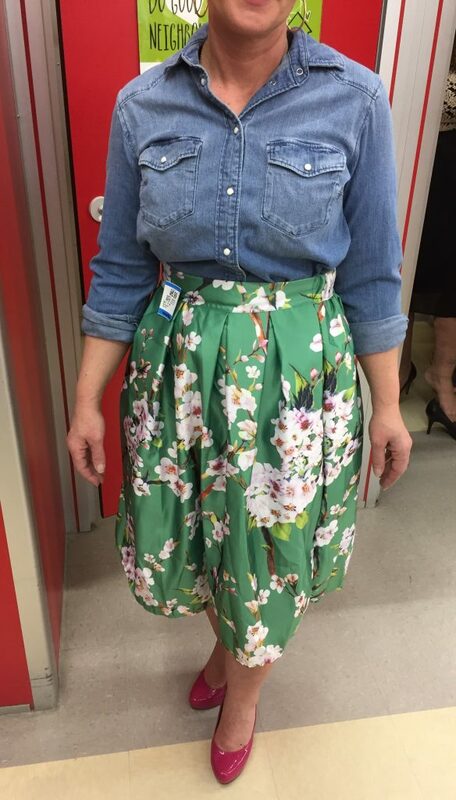 Too hip for a grandma?! 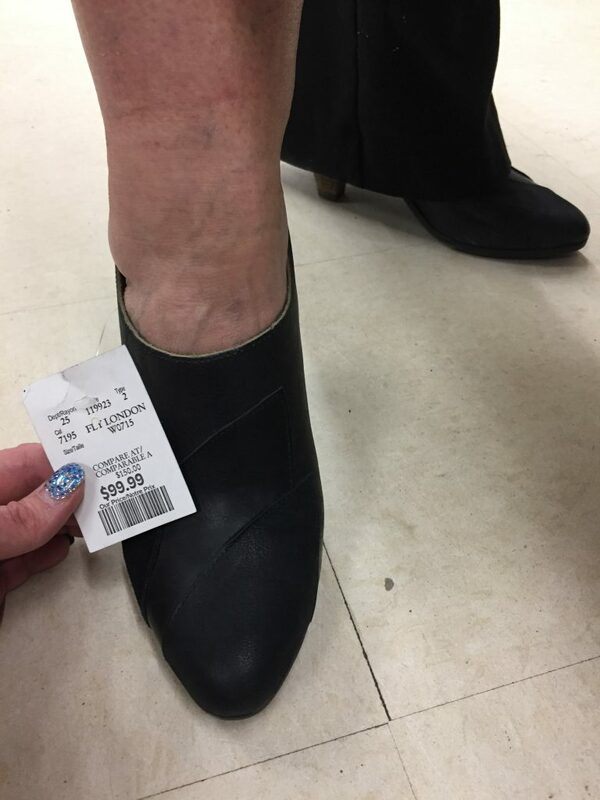 Not for this stylish grandma! A sleeveless pink top and printed kimono are the perfect light breezy layers for warm temps. 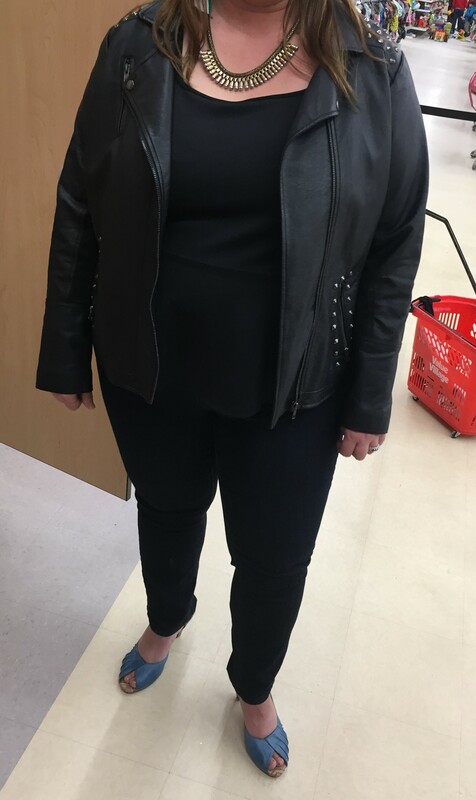 Bernadette scored like-new-condition Fly London leather ankle boots that are both comfortable and edgy,and added that contrast to the feminine kimono. Her outfit needed one more element to fulfill the “rule of 3” (you need 3 pieces up top for a look to be complete) and the dropped-heart pendant did just the trick! An unexpected outcome of the evening was that all three outfits from “The Edmonton Spring Collection” picked up colours and elements from each other to create an overall cohesive look, just like any designer collection! Well done ladies! 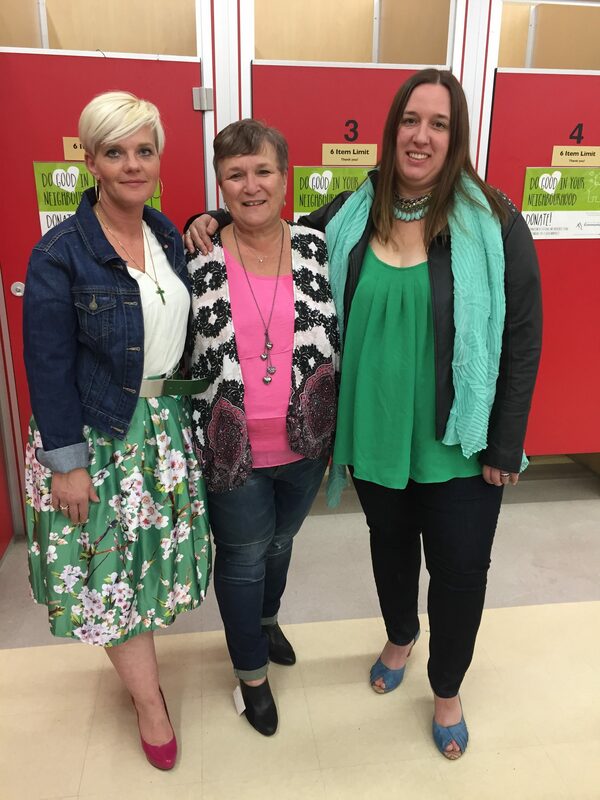 I had such a lovely time with Corrine, Tiffany and Bernadette and am so pleased they all found outfits that look fab! They’ll do Edmonton proud in the fashion show!